For many of us the book of Job stands directly in the centre of one of the most complicated problems of life - the interaction between divine sovereignty and human responsibility. Its implications for a world of suffering and injustice is one that has provoked much tortuous thought for both Calvinists and Arminians. How Job deals with tremendous suffering - losing most of his earthly possessions, family and health - and how God deals with Job’s suffering, does not necessarily make a nicely packaged story. The issues Job faced are ones that all Christians will struggle with to one degree or another. Calvin is still an influential theologian and was an excellent preacher. 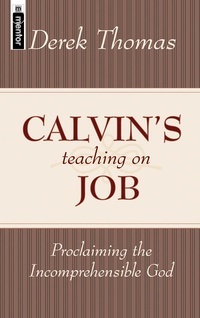 Derek Thomas uses Calvin’s sermons on Job as a model for preachers today.